One important point to note about Accounts and Contacts is that both can be considered as Customers for the purposes of the sales cycle. 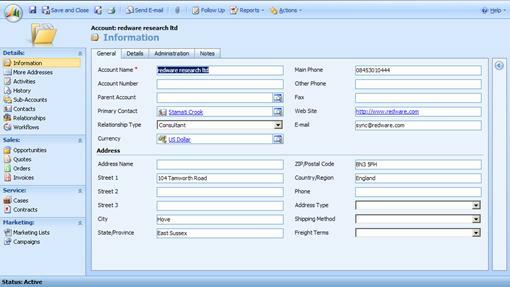 Opportunities, quotations, orders and invoices can be specified against either Accounts or Contacts as required (there does not seem to be a way to configure just B2B or B2C commerce). Accounts in CRM refer to companies and not just sales accounts. Many installations rename this entity to avoid confusion. · The primary contact can be used to specify the default contact. · Select the contacts view from the left hand pane and add a new contact to copy the address and other fields across to the new contact automatically (in accordance with the mappings set up in the customisation). · The relationship type is a convenient field to categorise companies as suppliers, competitors, customers, prospects and so forth. 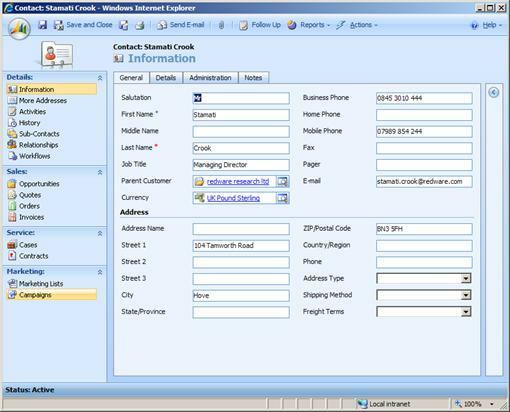 · Accounts have a currency which is automatically applied to new contacts when they are added from the contacts pane. · Two addresses can be stored in the entity, with additional addresses stored by selecting the addresses view on the left hand pane. · The parent customer can be used to specify the ownership hierarchy of groups and companies. Contacts contain the standard contact information and the parent customer usually specifies the company for which the contact works.